Click the Preprocessing button. 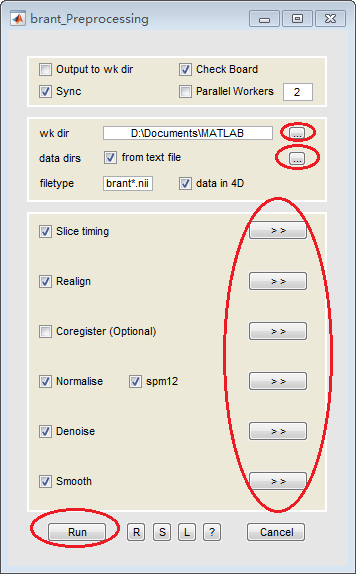 Select the folders as data dirs where STEP 1 outputs. You can check the from text file and select a brant_preprocess_paths.txt file which has already automatically created. Check the checkboxes you need, remember to modify parameters. You donnot need to check the Coregister checkbox without structural images. Remember to change the source parameter in Normalise to co*.nii if you’re preprocessing images with structural images. If an error occours during preprocessing, the R (refresh) button can recover the run button. Further information about output files can be found in the Filename part.